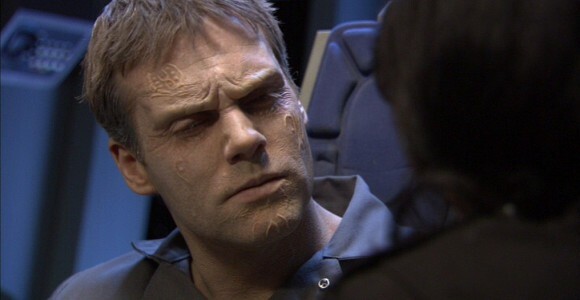 When SG-1 discovers that Daniel Jackson has been turned into a Prior of the Ori, they must determine whether or not his plan to destroy the Ori is genuine. Cameron Mitchell, Samantha Carter, Teal’c, and Vala Mal Doran visit another world, where yet another village of humans has been approached by a Prior of the Ori. They talk with the village leader, Tevaris, who explains that a Prior has recently visited them and spoke persuasively about the Ori religion. The team is curious to learn from Tevaris that this particular Prior has yet to make any threats that the village will face death and destruction if they refuse to follow Origin. Instead, he is using a “soft sell” method of evangelism, sharing only the benefits and positive merits of Origin as the one true path to salvation. How did Daniel learn which planet SG-1 was going to be on, in order to arrange for his capture? How did Vala know how to finish assembling Merlin’s anti-Ori weapon? Will Earth attempt to reestablish the connection from the Pegasus Galaxy to the Supergate? Did Merlin’s weapon work? Have any or all of the Ori been destroyed? Did Adria survive the weapon’s detonation? Would it have any impact on her, as a human who was sired by the ascended Ori? Even if the Ori have been destroyed, would their human followers even know about it? Are their military forces now under Adria’s control, with no accountability to the Ori themselves? What could convince the Ori’s followers to stop their bloody campaign? “The original plan had been to have Daniel go Dark Side and play out his descent, turn, and ultimate redemption over the course of several episodes. In fact, in its original, multi-episode version, this story would have demonstrated a much, much darker Daniel — but it was ultimately decided that making him too dark, regardless of the circumstances, would have damaged the character so the decision was made to make his turn to the Dark Side a little more uncertain. I don’t know. I’ve always wanted to explore the theme of redemption with these characters, push them to the line — and beyond — and then bring them back and have them suffer the consequences, because, in the end, its their emotional response to these consequences that creates drama and explores hitherto uncharted facets of their personalities. “The reveal of the pale, milk-eyed Daniel stands as one of the top ten Stargate tease-outs ever. Hmmm. Now that I think of it, that could form the basis of a future top ten: My Top 10 Favorite Stargate Tease Outs! File that one away for a future blog entry. “Anyway, a terrific Daniel Jackson episode that sees the return of Jack O’Neill and one final, glorious in-series reunion between the two best friends. VOTE! How would you rate SG-1's "The Shroud?"